Bed bugs get their name because they are commonly found in beds but can also be found in other places where humans spend a lot of time: hotels, airplanes, and couches. 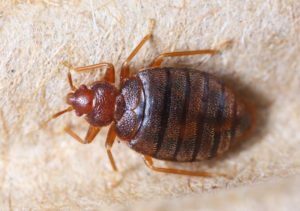 Bed bugs can feed on the blood of any warm-blooded animal. Their most common targets are humans because, unlike animals with fur, we have a lot of exposed skin for them to bite. Bed bugs are typically found in beds and small cracks and crevices. Bed bugs are typically found in beds and small cracks and crevices.When Bed bugs feed, they inject the skin with their saliva (this keeps the blood from clotting) and an anesthetic (this keeps the host from feeling the bite and moving). Bed bugs do not spread disease, but their bites can become red, itchy welts. Don’t take mattresses or padded furniture that has been left at the curb or on the street. Check your bed sheets for blood spots. Keep your suitcases covered in plastic and off the floor when you travel. When you travel, take a small flashlight to help you look for bed bugs. When you return from a trip, wash all of your clothes – even those that have not been worn – in hot water to ensure that any bed bugs that may have made it that far are not placed into your drawers/closet. Bed bugs are hard to see, so if you think you have bed bugs, call a pest management professional.